The RV-Pette Pipette provides accurate and reproducible repetitive pipetting from the single filling of a disposable tip. Use of the RV-Pette saves time and reduces the fatigue associated with repetitive pipetting using a standard pipettor. 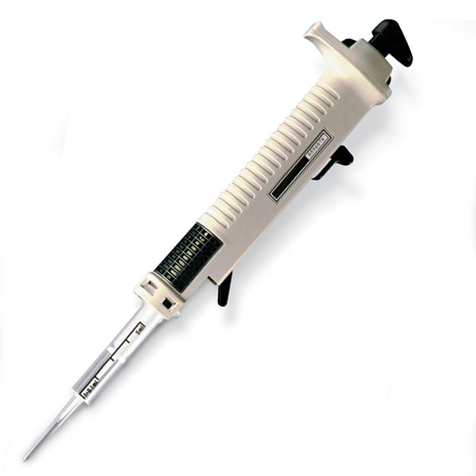 Twenty nine different volumes between 1uL and 5000uL may be dispensed with this pipette. As many as 48 pipetting steps may be carried out without refilling the reservoir tip. Samples can be dispensed at intervals as fast as 1 second without compromising accuracy or reproducibility. The slender body of the RV-pette fits comfortably in the natural contour of your hand. 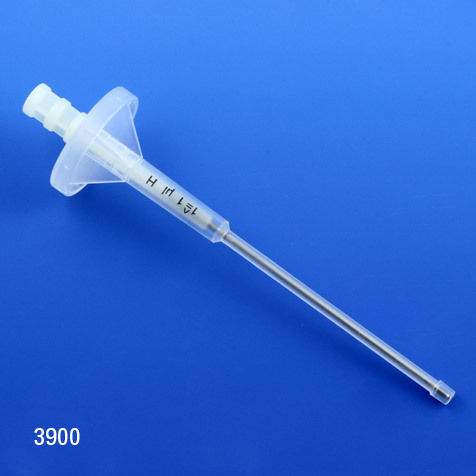 The plunger is located on the top of the unit, like that of a standard pipette, for easy access and reduction of hand strain. The RV-Pette is simple to use - select the appropriate tip and lock in place. Then choose the desired volume setting with the click stop adjustment dial and fill the tip with the required volume using the sliding fill lever. To dispense, depress the plunger. For convenience, a chart showing the volume dispensed for each tip size and dial position is located on the body of the pipette tip. The RV-Pette performs best when used with Globe's dispenser syringe tips.